"Lo! Dost thou not see, Meg, that these blessed fathers be now as cheerfully going to their deaths as bridegrooms to their marriage?" Thus the famous words of St Thomas More to his daughter as he witnessed from the window of his cell the first three Carthusian martyrs, Sts. John Houghton, Robert Lawrence and Augustine Webster, priors of the charterhouses of London, Beauvale and Axholme respectively, being prepared for their journey to Tyburn, on the morning of May 4th, 1535. St John Fisher is believed to have blessed them from another window as they were led to the hurdles upon which they were pulled to the triple tree, dragged through the filth of the London streets to that place where now the thunderous traffic roars past Marble Arch. Some thirteen weeks later, one Andrew Borde, an ex-Carthusian of a sort, climbed the wild heights beneath La Grande Chartreuse, his will set firm upon seeing the new Prior-General of the Order, Dom Jan Gailhard, so that he might finally and properly be dispensed from his vows. For Andrew Borde had left his charterhouse in London some sixteen years before. He had begun the process for dispensation, but had then in his impatience sought civil leave to abandon his religious state. Such a dispensation still needed ratification from the head of his Order for it to be legitimized before God as it had been before the English state. His mind had only recently been turned to such a ratification, and he had toiled across the plains of eastern France and the Dauphiné before beginning the difficult ascent to that most withdrawn of monasteries. As he struggled through the briars and stumbled along the rocky paths, he could hear above him the tolling of the great bells of La Grande Chartreuse and his mind must have gone back to similar tollings for identical prayers and summonses in his youth inside the sheltering walls of the Charterhouse of the Salutation of the Mother of God in London. Welcomed into the guest-house of La Grande Chartreuse, he talked of his own need to obtain this final dispensation from his vows. He seemed to guests there, and to the guest master, a worthy though occasionally flippant priest — but that his heart was good seemed assured from his having made such a long and tiring journey in order properly to ease his conscience and his soul. Questioned about the state of the Church and of the nine charterhouses in England, Andrew Borde has much to say, despite having been on the continent and therefore away from his home country since the fading frosts of February of that year. The prior of the London charterhouse, he reported, was in grave trouble for disobedience to the king, for causing disturbance within the charterhouses across the country, particularly his own, and for failing to recognize the King's good will. Some others in the London Charterhouse were suspected of disloyalty to Henry, Defensor Fidei. News travelled slowly in the sixteenth century Europe. Somewhere between Tyburn and La Grande Chartreuse, the last words and prayers of the martyred Carthusians, the groans and moans and cheers and jeers of the transfixed crowds, had died upon the wind. No-one in that Alpine retreat had yet heard the woeful news. Andrew Borde had arrived at La Grande Chartreuse shortly after the meeting of the Order's Provincial Chapter. Priors from charterhouses across Europe had toiled to their fatherhouse across an increasingly troubled Europe, bringing almost without exception disturbing news. For years there had been increasing difficulties with secular rulers across Europe. Carthusians knew that their houses were always dependent upon the favour and protection of the local secular power, and that from time to time there would be disagreements, some trivial and some serious. In Germany, a disagreement between the municipality of Nuremberg and a local prince had led to the charterhouse there being seized and partially destroyed. Similar problems obtained in Saxony with the charterhouse of the Passion of Christ at Leignitz. In Sweden there were particular difficulties at this time with the prerogatives and privileges of religious houses, including the Charterhouse of Our Lady of Peace, being seriously threatened by new rulers. More worryingly, there was a notable rise in the number of instances of disturbance from artisans and the lower classes across Europe, increasingly aided and abetted by minor — sometimes significant — princes. There were riots and bouts of iconoclasm — not unconnected to the evident rise of heresy across Germany in particular. Some charterhouses had been raided and burned, although no monks had yet come to harm. A good example of this was the case of Münster. This Westphalian city, a bishop's see, had fallen into the hands of strange insurgents. They proclaimed a reign of the New Israel under Han of Haarlem, Jan Matthyssoon. He claimed to be the voice of the Prophet Enoch, until at Easter he changed his mind and decided he was Gideon. By this time the city was ringed by the armies of the local Catholic princes, determined to restore order and rid the city of the fanatics. "Gideon" sortied out of the city across the mud flats in driving rain with thirty men at his side, convinced that he would defeat the papistical hordes, only to fall in gore and mud on the pikes of landsknechte mercenaries. Apocalyptic happenings for an apocalyptic time. Even then Münster had not fallen — Jan of Leyden took over the madness, proclaiming the Second Advent and the Fifth Monarchy. But the city was finally taken a few weeks before the General Chapter, and Jan of Leyden and the other incendiary sectarians killed. Such portentous events as these were not, however, taken lightly. Moreover the charterhouses in Hungary and Slovakia, at the outpost of eastern Christendom, were under the direct threat from Ottoman armies, notwithstanding the failure of the great Turk before the walls of Vienna in 1529. In that year, five monks and the Prior has been killed by Moslem raiders at the Charterhouse of the Valley of All Saints at Mauerbach in Austria. And so Prior-General Jan Gailhard was unhappy to hear from Andrew Borde that in England too there were worries and disturbances — portents so far of a milder sort, but portents still. No English Carthusian had attended the General Chapter since the representative Prior or other English appointee was required only to make the journey to La Grande Chartreuse for those Chapters which fell in a leap year. In the light of the information gleaned from Andrew Borde, the Prior-General no doubt reflected for a while on how best to deal with this new challenge. He finally wrote to the Bishop of Lichfield, an old friend of the Order (although now a greater servant of the King than of the Church), asking him to keep a good and kindly eye upon the English charterhouses; expressing to the Bishop the profound gratitude towards the English king, serenissimo rege fidei christianae defensore, with which the Order was filled; and assuring them both, the Bishop and the King , of the Order's constant prayers. Against the Turk and the violent desperation of iconoclasm and heresy the princes had always been the greatest bulwark of the Church. Despite what the Prior-General knew of Henry's disagreement with the Pope over his divorce — not a unique matter in contemporary Christendom, nor historically — he was sure that Henry would act as guarantor for the protection and continued existence of the English charterhouses. How wrong he was. Andrew Borde was of course the agent of Thomas Cromwell. The King's secretary had recommended that he pay a visit to La Grande Chartreuse. Borde was kept in the dark about the fate of those Carthusians who refused to accept the King's Supremacy and reject that of the Pope. As he sat at guest table in the Alps he was as much in the dark as those to whom he spoke about the fact that English Carthusians had already been martyred — hanged, bloodily and terribly drawn, while still conscious (their internal organs wrenched out from their bodies to be thrust before their still-seeing eyes — a nice detail insisted upon by The Powers That Be) and finally quartered brutally. While Cromwell assured La Grande Chartreuse through his pliant and ignorant accessory that loyal Carthusians in England need fear nothing from King Henry, he was working towards the destruction of the Carthusian Order, alongside the destruction of all other religious orders in England, orders that had bedecked the country so gloriously for centuries. The Carthusians were famed for their holiness, for their asceticism. They were perfect first victims, to be made an example of for others and to ensure that their continued existence could not provide a potent rallying point for those opposed to the Royal Will which was now finally paramount in English law and in terra anglicana. After Ss John Houghton, Robert Lawrence and Augustine Webster were martyred, the next Carthusians to go to the scaffold were Blesseds Humphrey Middlemore, William Exmew and Sebastian Newdigate, on 18th June, some six weeks or so after the first executions. Like those who had gone before them, they were martyred in their habits. Sebastian Newdigate had been a friend and courtier to the young King Henry but had decided to set aside a life of privilege and pleasure for the Desert of his Cell and the Silence of the Service of God. It is said that King Henry personally appealed to him to accept the Royal Supremacy "for old times' sake". It is even suggested that the King forced himself to watch the executions, disguised in the manner of a common soldier. The six executions stunned the capital, stunned England and stunned Catholic Europe. The ambassadors to the Court of St James sent horrified missives to their royal overseers. It is not known what the reaction of the Prior-General was in his Alpine retreat when he finally heard of the martyrdoms in detail and from a credible source. The unveiling of the glorious resistance of some of his Order to heresy and schism must have been a cause of joy, but in the context of renewed disturbances in northern Europe that late summer, and an increasing sense of the Princes of the world deserting Holy Mother Church in favour of the promise of temporal gain through attachment to the growing Protestant party, it must have seemed as though the world had tuned upside down. But Cromwell still wanted the charterhouses dissolved. He knew that no one would fall for the tactic he was using so effectively with other Orders — to accuse them of gross corruption and to insist on dissolution as the only solution. Such an approach would not wash with the irreproachable communities of the English charterhouses. So he settled upon each charterhouse a pliant Prior drawn from the weaker elements in the Order, one who had already succumbed to royal blandishments; he scattered any small nucleus of resistance to the Royal will that he could discern, so that the staunch were isolated; he visited upon each charterhouse a succession of high ecclesiastics who lectured and cajoled and gurned menacingly, all bought off by royal favours or hope of royal preferment, all signed up to the decree Royal that Henry was now the Pope of the English church. He cut off each charterhouse from its brother houses. He saw to spiritual, if not actual, dissolution. The charterhouses festered in division, their common life fractured, their isolation from the world utterly compromised, the practice of their religion, their rule, hindered immeasurably. This went on for two years until Cromwell knew that those houses most cut off from the others, those of the north where the putting down of the Pilgrimage of Grace had perhaps had greatest demoralizing and terrifying effect, that these houses were finally ready to succumb absolutely to the royal will. On the second anniversary of the martyrdom of Ss John Houghton, Robert Lawrence and Augustine Webster, 5th May 1537, Cromwell (and there were no coincidences in Cromwell's plans) had all those Carthusians remaining at the London charterhouse interrogated. They were all — again — asked to swear to the King's Supremacy. The pliant Prior — a Cromwellian appointee as we have seen — and twenty of the community swore. Ten refused, and were, after further interrogations and menaces, dispatched to Newgate prison. Not all were choir monks: interestingly a majority of the ten were converse, or brothers, those who had bothered themselves about the woodwork, the drains, the roofs and the kitchen, and had spent less time in Office or in church. They all no doubt imagined the awaiting scaffold. But Henry was bothered. He feared more rebellion from his intransigently Catholic people. Although he had not yet allowed the country to drift too far into heresy, the sensus catholicus of the people was outraged by his actions. He could not inflame such rage by another display of martyrdom. And so the Carthusians remained in Newgate. They remained, unfed and unattended. They were left to rot, and rot they did. Their names? John Davy, Thomas Green, Thomas Johnston and Richard Bere (choir monks) and William Greenwood, Robert Salt, Walter Peerson, Thomas Scryven, Thomas Reding, and Willam Horne (conversi, or brothers). Bound hand and foot, iron collars about their throats, they were chained to posts in a single cell and abandoned. 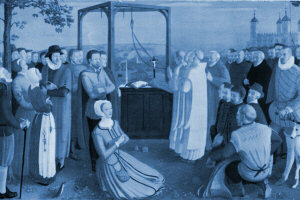 Margaret Clement, the adopted daughter of St Thomas More, for a while managed to gain entrance to the cell (largely on account of the fact that her husband was physician to the King — and due to her disguise, as a milk-maid), and there fed them what food and water she could, and cleaned them for their own filth. This was discovered and she then attempted to find a way in from above, breaking through the roof of their cell and lowering food to their mouths. Eventually, too, this was not possible. And so the good fathers and brothers died together in that dark and fetid place, one by one in prayerful silence, abandoned by Man but not by God. Greenwood, then Davy, then Salt; Peerson and Green upon the same day, mid-June; Scryven and Reding some days later. Somehow, Richard Bere (the nephew of a former Abbot of Glastonbury) survived until August 9th. Astonishingly, Thomas Johnson was still alive by September 20th, some sixteen weeks after his incarceration. He was removed to the Tower of London where he languished for a further two-and-a-half years before being martyred at Tyburn in the company of St Thomas More's son-in-law, Giles Heron, on 4th August 1540. These are all accounted Blessed by the Church. May they all pray for us who are unworthy of them. With this, the Carthusian resistance was no more. All the remaining monks and brothers were pensioned off. Two monks who resisted the King's will were sent north and hanged at Hull — Blesseds John Rochester and Richard Walwercke. All these facts and names we have because one of the pensioned monks, Maurice Chauncey, repented of his weakness, and, when Good Queen Mary returned after young King Edward's death, helped establish a new charterhouse in England and then went with it in exile abroad when Elizabeth came to cast Catholicism again into the gutter.